CURRENT PROJECT: "Who is Bound?" I challenge acceptable language used to label and limit people who require augmentative devices designed to include rather than exclude. My platform is the iconic wheelchair. 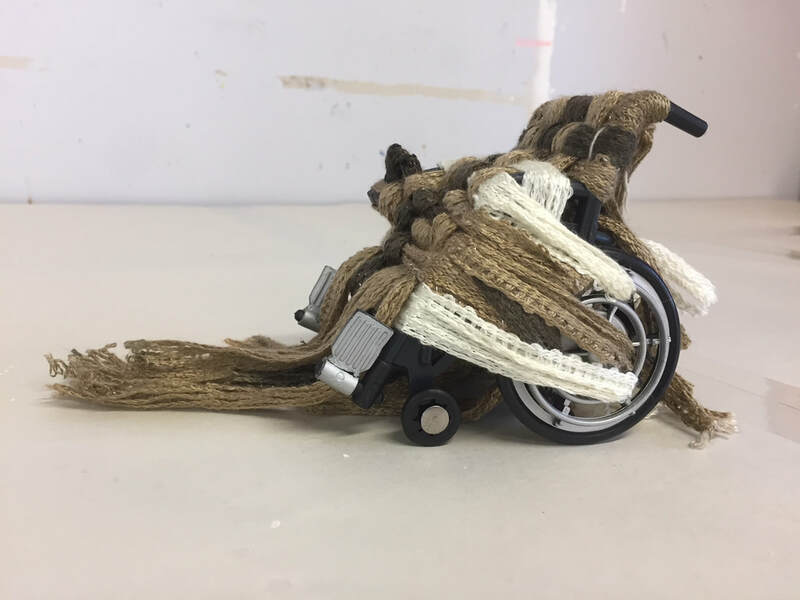 Working in miniature, participants use blank 3-D templates to depict wheelchair-boundness. Collections and processes are made public through social media, documentary video, and public spaces. To be "wheelchair bound" is to be limited, to be less than someone who is ambulatory. So, I ask, "Who is bound?" and I consider the word "bound," itself. Is the individual in the wheelchair bound TO the chair or bound BY the chair? When a book is bound, the pages are held together in a sensical way. When a person is homeward bound, the individual is returning to roots, family and community. To flip "wheelchair-bound" on end is my intention. I invite others, both ambulatory and non-ambulatory, to consider wheelchair bound-ness and ask, "Who is bound?" as well as, "Who is doing the binding?" This project crosses two cultures- those living with disabilities and those living without disabilities. Note: A culture is established through developing a history, a language, and its own behaviors including celebrated events and holidays. Those with specialized care (of their own or someone under their care) embody these elements just as main-stream cultures do throughout the world. A multi-ethnic, multi-sexual, multi-able participation is sought by calling creatives on both ends to evaluate these identity politics of individuals who require adaptive, augmentative supports for accessibility. By providing a matrix/model for continuity, participants have a blank slate upon which they can construct "bound-ness." Questionnaires with questions I pose here accompany the templates. The work is collected into gatherings where it is shared in social settings that provide platforms for exchange. The piece grows as more chairs are added. Documentary video follows the progress. And in its final stage, a mother-chair anchors all chairs to a common public place, accessible for all.